Austin set school records at Monmouth with 150 catches for 2867 yards (19.1 avg.) and 30 touchdowns over the course of 39 games. Coming out of a Division 1-AA program, he went undrafted in 2006 and signed with the Cowboys as a free agent. He was used exclusively as a kickoff returner as a rookie and had a 93-yard TD return in the postseason loss to Seattle. Austin continued to return kickoffs in 2007 and ’08 and caught a total of just 18 passes for 354 yards (19.7 avg.) and three TDs in a reserve role. 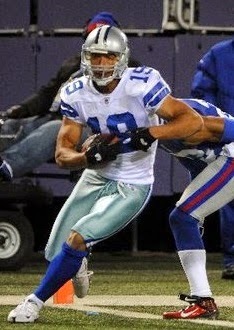 The departure of WR Terrell Owens opened up an opportunity for Austin, who had demonstrated potential as a deep threat. Cowboys went 11-5 to finish first in the NFC East while ranking second in the NFL in total yards (6390). Won NFC Wild Card playoff over Philadelphia Eagles (34-14). Lost NFC Divisional playoff to Minnesota Vikings (34-3). Austin followed up with 69 catches for 1041 yards (15.1 avg.) and seven touchdowns in 2010, with the loss of QB Tony Romo six games into the season due to a broken collar bone and the addition of rookie WR Dez Bryant contributing to lowered production. He was again selected to the Pro Bowl. Hamstring problems limited Austin to ten games in 2011 but he bounced back by catching 66 passes for 943 yards (14.3 avg.) and six TDs in ’12. After being held to 11 games and 24 catches in 2013, he was released and moved on to Cleveland for 2014, where he had 47 receptions for 568 yards (12.1 avg.) before being sidelined with a lacerated kidney. Overall, over the course of nine seasons through 2014, six in a starting role, Austin has caught 348 passes for 5049 yards (14.5 avg.) and 36 TDs, with 301 of those receptions for 4481 yards and two scores coming with Dallas. He also returned 89 kickoffs for a 24.1-yard average, all with the Cowboys.